I don’t own the skates, so I can’t personally answer this. however, when it comes to steel, the best place to start is usually Tyden and Step. They probably have steel available for you. They’re made by Step so you can find elsewhere besides True, but I doubt they’ll be much cheaper (if at all). Not sure but interested to know myself. Any pro shop or equipment managers out there?? Monkey sells the steel. I think it will only be Step. They also have the regular steel; I found the black. The process Step uses to polish the steel AND the coating itself will help you get more from each sharpening. I sharpen every time I go, but that is because I am that persnickety about my shallow edge and I have a Sparx. My main sharpening customer gets three to five times per week and goes every two weeks! I get a blank page when I try and edit. @Jonathon v to clarify- I used to sharpen my main sharpening customer’s skates every week when he had regular Bauer steel; now that he has Step black, he goes every two to three weeks and he gets an average of three ice times per week if not five. Step’s process to coat the steel hardens the edges a fair bit, giving you a longer-wearing edge. I am still not a Step dealer (yet), I can testify from my own experience on this. So you can get regular or black for those One Piece; from what your habits are, I’d get black. 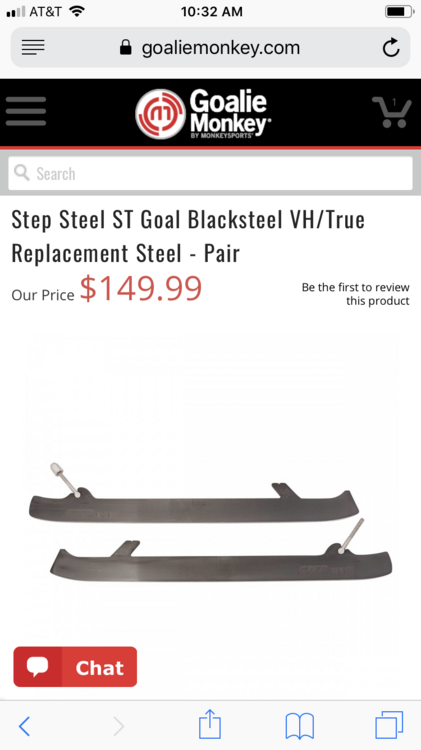 It is a listing for Blacksteel. I own the two piece True skate. I don’t know lots about the One Piece True *yet*, but may be getting a set for my own purposes, as I endeavour to install a set of Overdrive blades on a pair, being an Overdrive dealer and installer. I would also like to become a True skate dealer, as I believe they make a great skate with fantastic options. 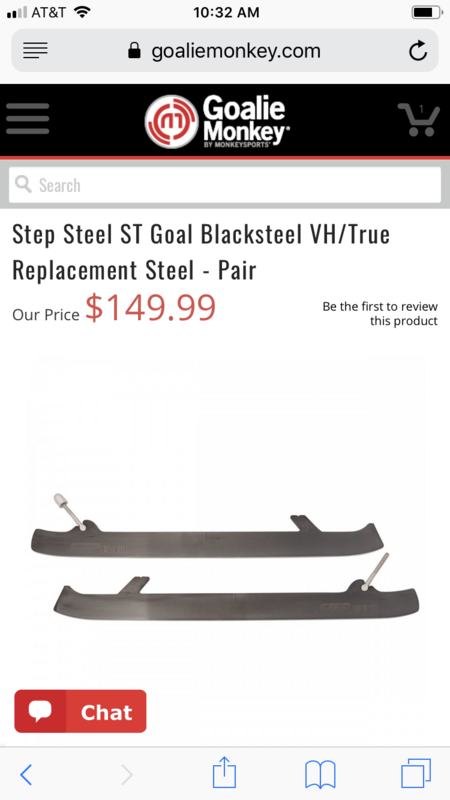 I do know a fair bit about Step Steel, as I will eventually become a dealership to supplement my skate sharpening business. Eventually, I will supplant my Sparx machine for a Prosharp unit that will profile as well as sharpen as I have found limits with the Sparx. Don’t get me wrong- the Sparx is a FANTASTIC option for many who don’t have access to a good sharpening experience, but that machine will maintain a profile good or bad. It also does not cross-grind (I was literally three months out from buying the pro unit), but have figured a way around that. I will be posting about the one piece True once I have made the decision on whether or not I will order. But I will confirm once and for all whether or not an Overdrive blade can be installed. @Jonathon v the Overdrive is something that is most likely not legal in your league. Yes, sir! Monkey also has regular flavour Step steel for the True skate. I think you would not need anything else in the layup to make those skates any stiffer unless you were over 250 lbs! The short “towers” on the skates’s blade holders definitely would equate stiffness. A LOT of carbon fabric goes in for a piece like that! Most people I do know using them (as I see a couple pair in the wild) say that the energy transfer is what they noticed FIRST. These were former cowling users, but users of the two piece would notice a similar performance gain. I do hear a different sound from crease movements. Shot blockers would likely not result in a loss of stiffness. If anything it may increase it slightly. As far as giving your feet room to grow, that would also most likely not affect stiffness. 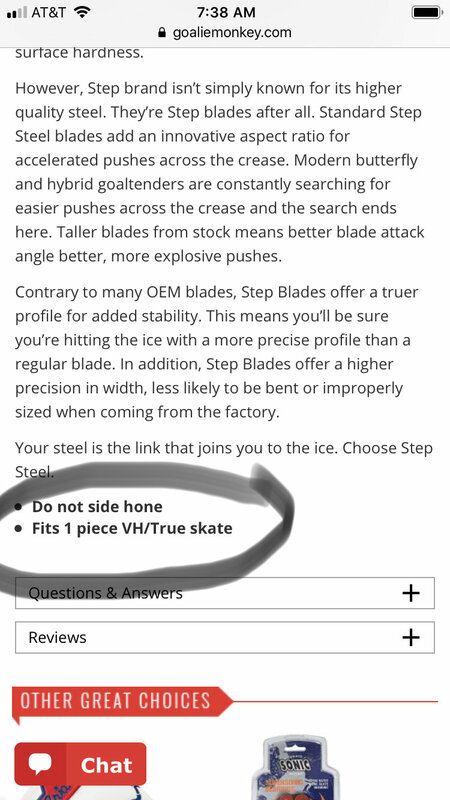 What would most likely happen from what I am hearing is that your skate would be sized slightly larger with padding in the toe that would be removed later; you would have to confirm with the fitter that is what would be happening. I would surmise that if any room to grow is given, it would be no more than 1/2 a size up. Unless you have supreme lacebite problems, a custom tongue would be overkill. As far as energy transfer goes- it us the construction if the boot and the fact that the boot and holder are fused, essentially making it one piece. It will not fit your one-piece True skate. If you read the name of the item, you could have figured it out quickly. See @Jonathon v? Mr @ZeroGravitas found both listings for us! Thank you Mr. Gravitas! My suggestion for @Jonathon v would be to get a couple of sets of steel, have them profiled and switch them out at each sharpening so that they wear evenly. Get them when you buy your skates. Profiling means that the blade is ground to a profile optimal for you and your skating style. Sometimes the blades may not be the same height, though with Step, they are better about being more consistent. But on a $1K skate, you want everything to be bang on! Also- the edge of the runner will be consistent and flat. As I say- on a skate you’re dropping that type of dosh on, profiling makes sense.